For starters, the nail polish. The glitter was this month's special gift and the purple is from the Classic with a Twist box. It was the only one I really wanted (or didn't already have a similar color to), so I added to my box for the extra (and reasonable) charge of five dollars. Love — Like I mentioned, this is the February gift. This polish has pretty decent coverage, but I'm not really a fan of multi-color glitters. Love is pretty heavy on the gold and has some traces of pink. On the nail sample, I used two coats and it covered completely. Overall, though, I'm not excited about this color and will probably be looking to trade it. I haven't seen many nail colors like it, so I don't have a dupe suggestion for now! 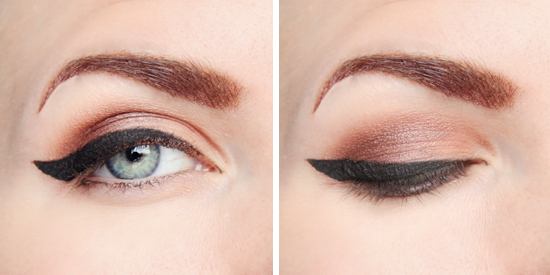 Alright, onto the eye makeup! I've been searching for a new gel eyeliner for a while. I have one by ELF, but it's pretty far from fantastic. Daily, I use Milani Infinite liquid liner for my winged eyeliner. I love the stuff, but it can be a pain to get off (hence the "infinite") and you have to wait for it to dry. I wanted something that could be a little easier for when I just need to run out the door or not for all-day wear. I also wanted to replace the ELF gel liner I used on my waterline. When I saw that Julep was introducing this gel liner, I really wanted to try it. Well, for starters, the gel liner make a very dark and pigmented mark. Awesome. The brush that came with it is weighted really well and makes it easy to pull the liner for smooth lines. In the second image I smudged it once by rubbing my finger over it. Not bad, really. And the last photo is when I used a baby wipe/makeup remover cloth in one stroke. It comes off much easier than my liquid liner, but if I am looking for something quick and easy, I suppose this does the job. But, I was disappointed when it came to actual wearability. This test is on my hand and obviously doesn't take into account the elements of wear makeup on one's face. I have pretty deep creases, and I found that this eyeliner smudged horribly in my creases. It looked terrible after about six or eight hours of wear. So, the next day I decided to use it only on my upper and lower waterlines. On my upper waterline, it was fine. On my lower, however, it smudged and ran in my eye corners. Unfortunately, I won't be wearing this gel liner on the regular — probably just when I run out to buy a carton of milk or to the post office. It will make do for my upper waterline, but that's about it. And onto the liquid eyeshadow. Normally, I'm not a fan. Again, because of how my eyes crease, liquid eyeshadows tend to have that gross, creased and moist look on my lids. Warm Fig is a fantastic color, however, so since it was already coming in my box, I figured I could find some sort of use for it. 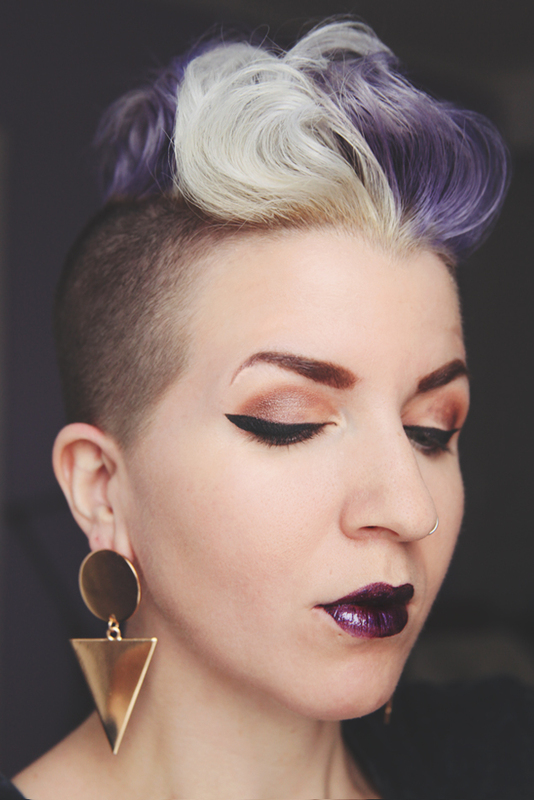 This is the look I tried with the Warm Fig. First, I used the Julep palette I got in the December Boho Glam box. Tiramisu is my every day color, so I started with that. Then I used the Warm Fig Eye Sheen on the outsides and crease of my eye, and slightly blending with Dusk from December's palette. Overall, I like this look. But, just I had worried, the cream eyeshadow creased and looked moist on my eyes. 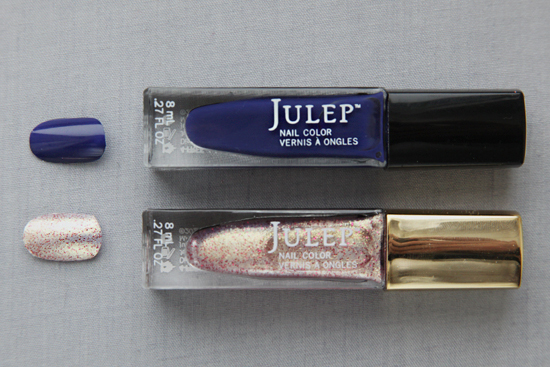 The photo above shows it paired with the Julep gel liner. I also pulled some of the Warm Fig in my brows just a bit. Because of the crease (or wetness? Ew) of my eyelid, I can't wear the liquid shadow as a full look, even with primer. The next day, I just used a tiny bit of the warm fig on the outside corners and it looked great without creasing. And yesterday I used it just as a waterline highlight on the inside corner and it also seemed to stay pretty well. For my first makeup-centric box, I'm a little bit underwhelmed. I don't think the products are bad, but they just don't work for me. I really wish they did. If anyone has any tips on how to avoid the gross eyelid smearing, please let me know in the comments! ❖ Again, I do like Julep for all of the reasons I've mentioned in the past — ability to switch box choices, share with a friend, skip a month, and claims to be female-focued (not so fast, more on this in a second). ❖ The purple polish is choice! ❖ The angled eyeshadow brush has a great weight to it. ❖ Underwhelmed with the liner and eyeshadow. I had really high expectations for both of these and was disappointed. ❖ The glitter polish really wasn't for me. ❖ Okay, as far as the whole female-focused thing. I'm actually a bit irritated with Julep and their recent marketing on "what men want." This was half of the reason I stopped subscribing to Birchbox. For a brand that claims to be female-focused, it seemed like a safe place to get away from all of these awful articles tellings us how to dress for men. But on their social media, they feel the need to ask men to take a survey so we can know what polish they want us to wear for Valentine's Day. Barf. When I asked them about it, they tried to shut me down. I tweeted and Facebooked them and was ignored until I emailed them — even then, they didn't respond to my email but then started sending me canned responses on Facebook/Twitter. A lot of brands don't interact on Twitter, but I've noticed that Julep only addresses people who praise their stuff and totally ignore anyone who has a serious question about their practices. This is a big, big turnoff for me. 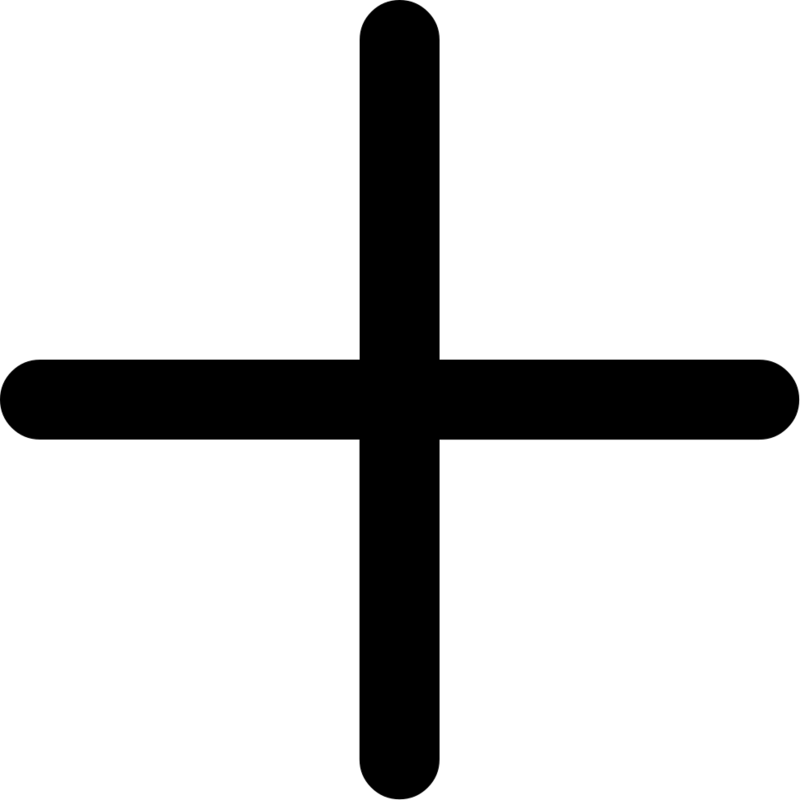 ❖ And beyond that, I'm starting to feel like it's getting sort of gimmicky. They're introducing new tools and telling us that we don't know how to paint out nails correctly. Starting soon, their polishes are all going to have new, shorter caps in order to try and convince us to buy some magnetic add on. A big thing that I like about the current bottles are the shapes. I'm pretty bummed about this as well. 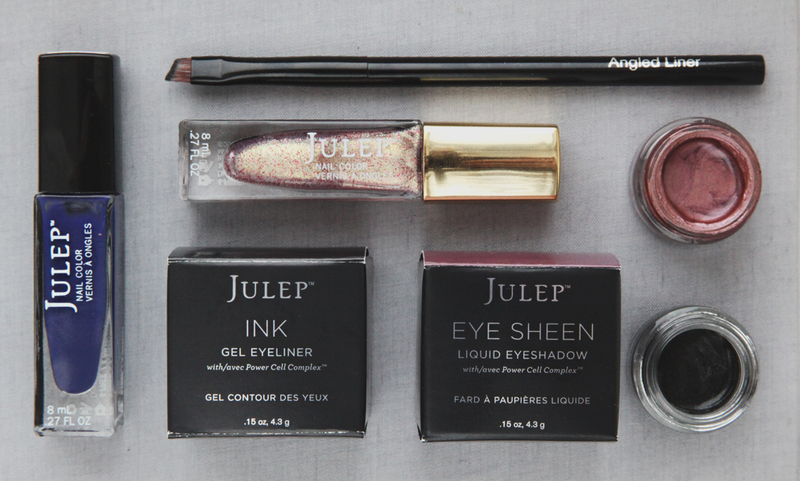 You can sign up for Julep Maven here and get your first box free when you use the discount code FREEBOX at checkout.